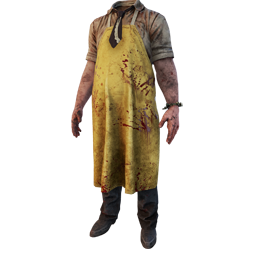 Bubba "Junior" Sawyer or "Leatherface" / "The Cannibal" is one of 15 Killers currently featured in Dead by Daylight . 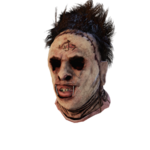 He was introduced with PARAGRAPH II: LEATHERFACE™, a Paragraph DLC released on 14 September 2017. He originates from the 1974 Horror Movie franchise The Texas Chainsaw Massacre. 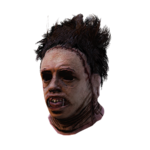 The Cannibal is a chainsaw-wielding Killer, able to trigger a deadly frenzy using his Power, immediately downing anyone in its path. 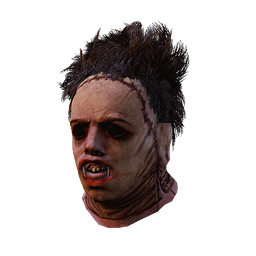 His personal Perks, Knock Out , Barbecue & Chilli & Franklin's Demise , make Survivors easier to locate while robbing them of their tools and abilities. His Perks revolve around the unknown. Nobody knows where anyone is, especially The Cannibal himself. You are not aware of his presence until his Chainsaw bursts through your spinal cord. Whether killers perform their heinous acts by the compulsions of their diseased minds, or if they are forced into them by external pressures, has long been a matter of debate. But for one killer, nature and nurture are inextricably linked. 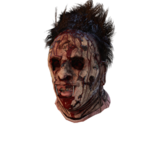 Leatherface kills not from a desire to exert his will over others, to satisfy carnal urges, or even to quiet the voices in his head. He kills because he is scared. Scared that others will hurt him; scared that his family will be displeased with him, scared that their shared willingness to eat human flesh will be discovered. He does as he is told, his family loves him and that is all that matters. Outsiders are a threat, and threats need to be dealt with. Like those kids that came into the house, uninvited. Walked in like they owned the place. Looked around the house, trying to find out his family’s secrets, no doubt. But Leatherface deals with them, protects his family, just as he’s been taught. He is not just protector, he has many roles, and each role has its own face. He serves dinner, cares for the family, dresses well when they eat. His Grandpa and Ma used to care for them all, but Grandpa he is old now and she has been still for a while, so Leatherface and his brothers had to take over. Family is everything to him. Family is security and safety. But, even though he did his best, one of the kids got away. He tried to stop her, chasing after her as fast as he could, but she had help: another outsider, driving a truck. The evil trucker killed his brother, ran him over like he was a possum. In a fury, Leatherface leapt at him, the saw ready to avenge his family, but the trucker was too quick. He knocked Leatherface aside and turned his own saw against him. As he watched the outsiders driving away, the rage, grief and pain combined with the worry about what would happen to his family now. They would surely return with the police, and the police would take his brothers, his Grandpa. Without them, what would he do? Without their commands, he would wither and die. As his world collapsed, Leatherface spun in circles, swinging the saw all around, trying to fight off the myriad external threats that surrounded him. Then another feeling overtook him. It came from outside his vision, crawling over his skin with cold dread. He realized that no matter what outsiders could do to him, there was something worse, something bigger that lived in the shadows. He was filled with a terror unlike any he had ever felt before. But it was almost comforting, like the fear he’d felt with his family. The fear of disappointing them. He was brought to a place that was familiar but unknowable, and he instinctively knew what he had to do. He couldn't fail it, the way he had his family. Outsiders would come but he would use his skills to overcome any threats. There would be screaming, but he could make the world quiet again. Until the only sound remaining was the blessed howl of the saw. 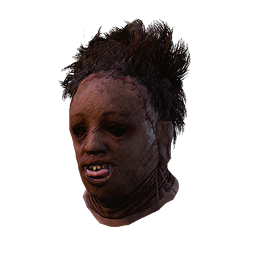 Once obtained, other Killers will be able to find The Cannibal's Perks in their respective Bloodwebs from that point onwards. 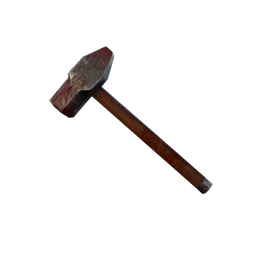 The Sledge is the Primary Weapon of The Cannibal. The Sledge might be old-fashioned but it is still the fastest and cleanest way to put down cattles. 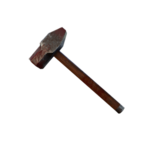 When he gets a successful hit to a Survivors , the Cannibal will shake the blood off of his Weapon. 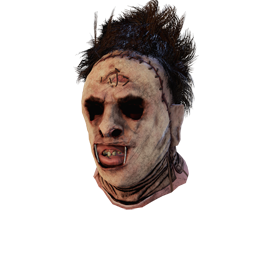 When he's about to perform his Memento Mori , he first hits the Survivor in the head with his Weapon then he drops it before revving up Bubba's Chainsaw. 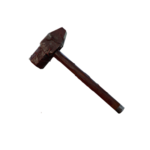 An incredibly powerful and heavy Chainsaw which sank its teeth into countless victims. A suitable birthday gift for The Cannibal. Start a timed sweeping attack on activation. Can hit multiple targets in one Chainsaw charge. 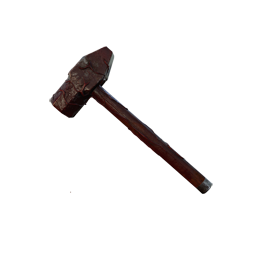 Running into an object forces The Cannibal into a Tantrum, this attack damages anyone around him. Automatically puts victims into the dying state on a successful hit. The Chainsaw charge won't stop until the user bumps into an object or gets stunned. The Chainsaw has a default charge time of 2.1 seconds. The Cannibal's Tantrum lasts for 5 seconds. There are currently 2 Achievements related to The Cannibal. Players may customise their Character by choosing one outfit style from each category. 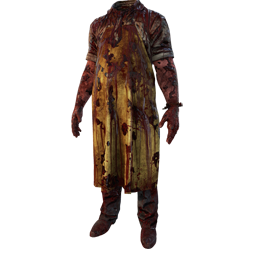 Blood-stained attire is obtained after The Cannibal reaches Level 50 and prestiges. 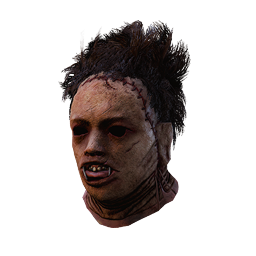 The Cannibal, as a unique case, has 4 customisation options based on the four original Survivors, Dwight, Meg, Claudette & Jake, that are locked. They are unlocked by sacrificing 25 of the respective Survivor. Dead by Daylight's Leatherface is based off the Killer mask Leatherface from the 1974 movie Texas Chainsaw Massacre, hence why the Character's real name is Bubba "Junior" Sawyer. In subsequent films, Leatherface's real name is Jedidiah "Jed" Sawyer or Thomas Hewitt, depending on the film's timeline and continuity. 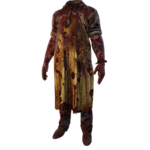 The Cannibal is the fourth licensed Character to be introduced to Dead by Daylight . Other licensed Characters are The Shape , Laurie Strode, Bill Overbeck, The Nightmare , Quentin Smith, The Pig and David Tapp. He is the second licensed Killer to be introduced after Michael Myers as The Shape. 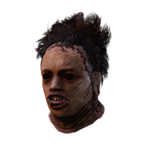 The Hillbilly is said to be based directly on Leatherface and the Texas Chainsaw Massacre franchise, explaining their similarities in looks and abilities. 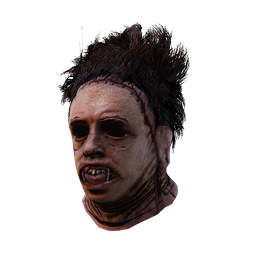 The Cannibal is one of three Killers that can instantly put Survivors into the Dying State without any Perks or Add-ons . The other two Killers being The Hillbilly , The Shape . 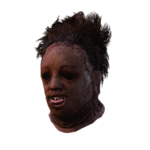 The Cannibal when in Tantrum mode has his speed dropped to about equal to that of the Nurse when she is warp fatigued. The Cannibal's Memento Mori animation was the first one in which the Survivor attempts to get up on their own. 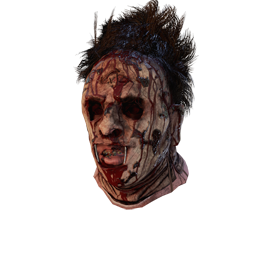 The Cannibal is the fourth Killer to wear face masks. The other five Killers are The Trapper , The Shape , The Huntress , The Pig and The Legion . 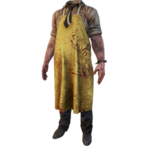 The Cannibal is one of the most human-looking Killers in the game, as he doesn't have any unnatural alterations to his appearance like most of the other Killers. He shares that trait with The Shape ,The Huntress ,The Pig and The Legion . While revving the chainsaw Cannibal moves slower than survivors, use the Chainsaw when close to survivors. Bumping into objects will result in a long stun animation. If survivor tries to avoid your Chainsaw charge by jumping into a locker, simply bump into the locker. If the survivor comes out they will get downed by the chainsaw and if they wait it out you'll still be able to catch them easily. 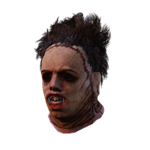 Use Chainsaw to counter Hook saves, when survivor is about to unhook another one rev up your chainsaw and then attack with it when both survivors are stuck in animation. Chainsaw charge is especially strong against basement rescues. Try to use the Chainsaw attack in open, rather than in clustered place, as you can easily bump into objects and get stunned. 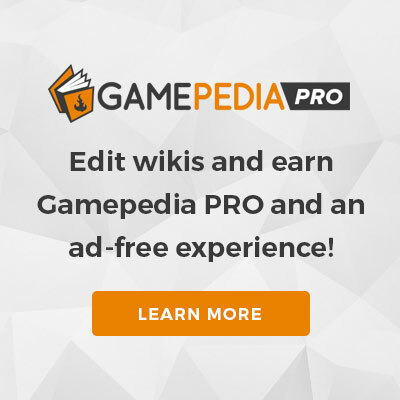 This page was last edited on 27 March 2019, at 18:33.